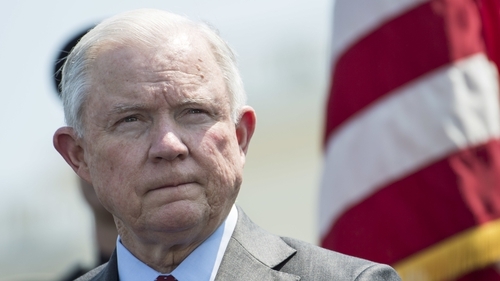 US Attorney General Jeff Sessions has overturned a grant of asylum to a Salvadoran domestic abuse victim, potentially excluding immigrants seeking refuge from sexual, gang and other forms of violence in their home countries. Mr Sessions' finding followed his unusual move to intervene personally in the case known as the "Matter of A-B-." The woman, who is only identified by her initials, had won an appeal to the Board of Immigration Appeals, which had overturned a lower immigration court judge's denial of her asylum petition. "In reaching these conclusions, I do not minimise the vile abuse that the respondent reported she suffered at the hands of her ex-husband," Mr Sessions wrote in his order. "I understand that many victims of domestic violence may seek to flee from their home countries to extricate themselves from a dire situation or to give themselves the opportunity for a better life," he continued. "But the 'asylum statute is not a general hardship statute,'" he said, citing an earlier immigration case. An attorney for A-B, Karen Musalo, called the decision "devastating" and said it had been anguishing for her client. "You have a woman who barely survived more than a decade of horrific violence, who finally feels that she secured safety ...and now she's thrown into total turmoil again," said Ms Musalo, who directs the Center for Gender and Refugee Studies at the University of California Hastings' law school. Mr Sessions' decision drew immediate rebukes from dozens of immigration rights advocate groups and lawyers. Some said the decision could have wide-ranging impacts on immigrants fleeing gang violence and gender-based violence, including female genital cutting or honour killings. "This is not just about domestic violence," Ms Musalo said. "What Sessions is doing is a broader, frontal assault on women's' rights." Michelle Bran, director of the Women's Refugee Commission's Migrant Rights and Justice program headquartered in New York, said, Mr Sessions’ decision to limit the reasons why people can claim asylum is a devastating blow to families who come to the US seeking protection and safety. "This administration continues to swiftly deconstruct America’s moral code and values by doing everything possible to limit access to asylum," she said. US House of Representatives Democratic leader Nancy Pelosi joined those denouncing the decision. "The Trump Administrations inhumanity and heartlessness know no bounds," Ms Pelosi said in a news release. "Republicans in the White House have just condemned countless vulnerable, innocent women to a lifetime of violence and even death, just to score political points with their base."